Located in the BluWater Crossing Development of Carlsbad, The Desehsa Charter School site is a 12,700sf lot accommodating both a preschool and primary school. As a first time tenant of the space, the Client jumped on the opportunity to turn the blank yard, into a dynamic outdoor play environment for both the preschool and primary school. Working closely with the staff, the new schoolyard is designed to meet the various needs of the students and staff, while providing a habitat ‘stepping stone’ in the community. We anticipate the site will attract many of San Diego’s native bird and butterfly species. 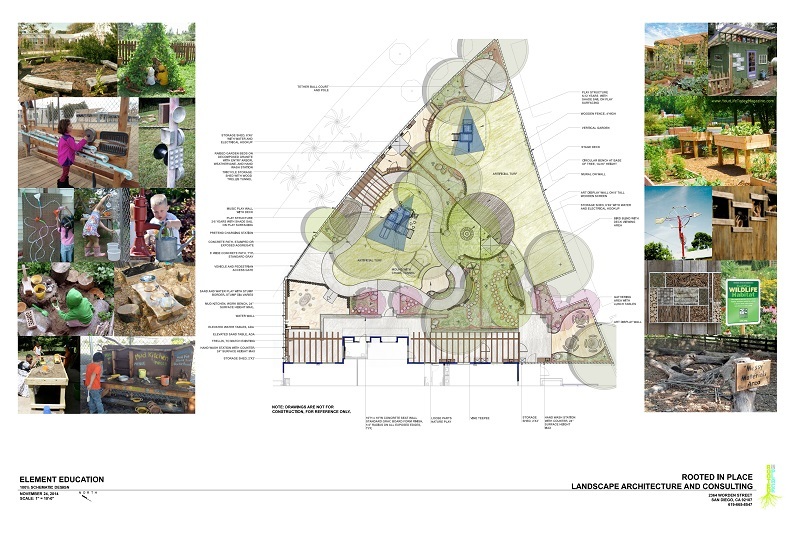 Estimated to be built in the Spring of 2015, this small space creates a challenge for designing separate play yards that meet the needs for the diverse users. Making efficient use of ground level and vertical surfaces, the design offers extensive play and learning settings for each age group. The Dehesa Preschool Play Yard includes: a tricycle path, grass mound with tunnel, music play, edible garden area, native wildlife attracting plants, wildlife view areas, loose parts play area, sand and water play, and outdoor classroom space. The Dehesa Elementary Play Yard includes: an edible garden area, native wildlife attracting plants, wildlife view areas, outdoor classroom space, stage, lunch area, vertical gardens and art display areas.